TJ Formal Dress Blog: Ask TJFormal: Are you an established company? Q: Is TJ Formal an established company? TJ Formal has been in business for over 40 years. Our company was established in 1969 with a retail shop in Joplin, Missouri and we began selling on the Internet in 1997. 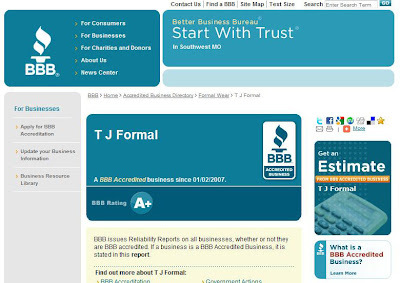 TJ Formal has been a Better Business Bureau Accredited Business since January 1997. You can see the BBB logo at the bottom right of every page on our site. And we encourage you to look us up on the Better Business Bureau website. When you do, you will see we have an A+ rating with very few complaints over the last few years. We process thousands of orders every year and almost 100% of our customers are extremely satisfied! We are a Top Website listed on the Prom Website Association. You can also find this link at the bottom of every page. You can read the many testimonials from our very happy customers on our site. We are a family-owned business committed to excellent customer service and the highest quality of products. We work to resolve every issue in a way that is satisfactory to both parties and all of our business practices are clearly spelled out in our Frequently Asked Questions section. Don't hesitate to call us toll-free at 1-877-769-1336, send us an email through our Contact Us page, or start up a live chat to answer your questions and concerns. We are always happy to help you choose a dress, or ease your worries about ordering online!